Four color slides showing Sonia Domsch, a bobbin lace maker and samples of her work, at her home in Atwood, Kansas. Using fancy linen thread she has created doilies and decorative lace for use on clothing and handkerchiefs. 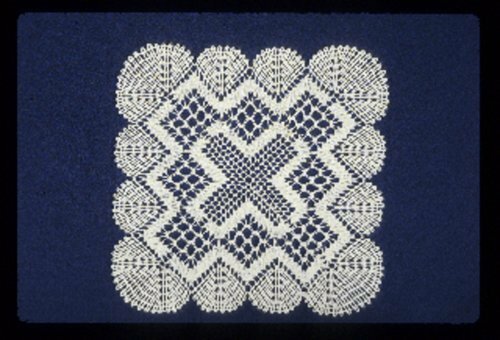 Her love of bobbin lace making can be traced to her Czech family heritage. Sonia has served as a master artist in the Kansas Folk Arts Apprenticeship Program since it began in 1985.